The task of takeoff is the most time consuming and error-prone part of construction cost estimating. Our eTakeoff Dimension software quickens the pace of accurate takeoffs with sophisticated assemblies, a patented symbol search for auto counting, innovative work breakdown capabilities, cutting edge database technology, and more. eTakeoff Dimension is so geared to simplify how estimators work, even Dodge Data & Analytics selected our Basic version for use in its plan rooms. The construction industry’s top estimating integration platform. 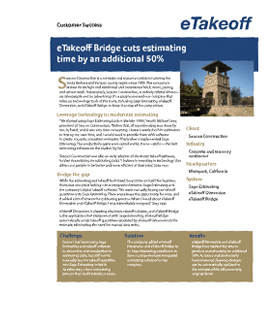 eTakeoff Bridge helps you build a solid base by efficiently transferring precise takeoff information from Dimension and into the most popular estimating software used by contractors—Sage Estimating. Bridge also integrated with “Best in Class” 3-D BIM tools such as Autodesk’s Navisworks and Assemble Systems. You can transfer any combination of 3-D model takoff and 2-D electronic takeoff through Bridge into a single Sage Estimate, transferring all takeoff data completely automatically or making manual adjustments as necessary. 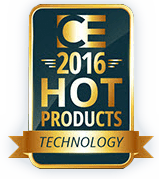 eTakeoff Dimension is an Industry Award Winner from Software Advice.